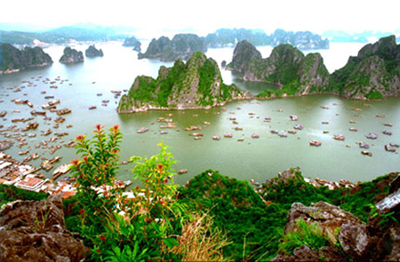 In Quang Ninh tourism portfolio and Halong bay complex, Bai Tho mountain is one of famous sights. Almost everybody hears about Bai Tho mountain though some don't know where it is. Apparently the name Bai Tho is very appealing to visitors, however if you have a chance to visit it you would regret a neglected landscape. Bai Tho mountain is a famous place but very hard to find. There is no clear address and we had to ask the way, actually few people know where it is, and when the mountain imposingly appeared in front of us we don't know where to find the road up to the mountain. Continued for a long time asking passers-by, taxi drivers and shop owners and a few times going around the foot of the mountain at last we found the way, a dark and narrow lane, squeezed between two little houses in the street, it was really difficult to see it. We were very surprised, it was unbelievable that the way up to famous Bai Tho mountain is just a small path, there were no signs except a few words "Road to Bai Tho mountain" written on a dirty advertising panel of a shop located on the sidewalk. We parked the motorbikes at a shop beside the lane, we advanced to the "entrance", dark, wet and smelly. We were not happy with the first impressions however we kept going as we were more interested in the scenery and wanted to view the beauty of Halong Bay on high. He answered very quickly "that's it, entrance fees 1 usd". Now we understood this man was a security guard or some certain role. We paid the tickets and followed his guidance, through the smelly alley full of goat dung, he chased the goats and clear the way for us, it seemed the goats were not of his own, perhaps the goats were raised by a family in this place, at the end of the alley he told us to keep walking straight on. There were many things worth mentioning about Bai Tho mountain, from the foot to halfway up the hill, the path are built with steps by concrete and easy to climb, when we arrived halfway uphill the steps were smaller and gradually replaced by stones and rocks, the spacious path became narrower and hard to walk. Throughout the path was goat dung couple with some rotted fruit on the ground, all combined and made an unbearable smell. The higher we climbed the harder the path became and we had to squeeze our way between sharp rocks and trees, we became disappointed with the famous mountain with a beautiful name. Perhaps the only consolation for those who labor their effort and patience to climb to the top of the mountain is the view of the bay from high. At an altitude of about 200 meters, visitors can have a panorama view of the legendary Halong bay with all islands and sea, the morning scene of sea and sky with small islands looming behind the thin silvery mist, some tiny boats cruising on water. Only standing on Bai Tho summit overlooking the bay one would understand how valuable it is and feel and extremely regret for a scenic landscape of which the values are forgotten. We descended the mountain and felt disappointed with this famed mountain. Bai Tho (Poem) mountain, a very beautiful and suggestive name and we are sure every tourist must have heard of this place. We came here with hopes and curiosity and felt the deep disappointment. Some photos were taken as achievements obtained. It seemed to me that there are not many people visiting this place, even people living in Halong don't come, the evidence was that when we asked for directions to the Bai Tho Mountain and road up to it they didn't know where to show us. To be fair, Bai Tho Mountain is a scenic, very valuable tourist spot, and can be used for tourism, especially this is the highest peak to have a panorama view of Halong bay. The view from it is extremely beautiful. It is difficult to understand that Halong Bay, recognized as a world heritage and one of the seven New World wonder where a beautiful and scenic value was neglected, sorry for such a beautiful place.